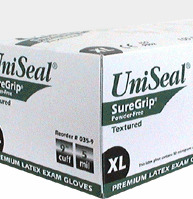 Micro-textured for a better grip, UniSeal® SureGrip® Latex Exam Gloves are used in laboratories, hospitals or other environments where items can get wet. They are washed in a chlorine base to remove skin-irritating proteins, so they meet the FDA's definition for a "low-protein" glove. While most powder-free gloves are yellow in color, the UniSeal® SureGrip is white and does not retain a chlorine odor.